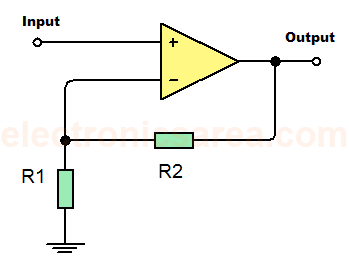 The inverting summing amplifier using op amp outputs a voltage equal to the sum of the voltages it has in its inputs. The following explanation is based on an adder of three inputs, but applies to an adder of any number of inputs. Av = – R4 / (Input resistance) = – Rf/Rin. This formula applies to all entries. 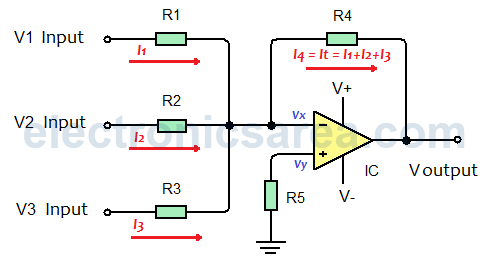 In an inverting amplifier, the current of the input signal flows through the feedback resistor. This is so due to the “virtual ground” characteristic of the operational amplifier, where the two inputs, Vx and Vy of the operational amplifier are equal to 0. (Vx = Vy = 0). Since there are three input currents in this summing amplifier, then all these currents will flow through the feedback resistor. 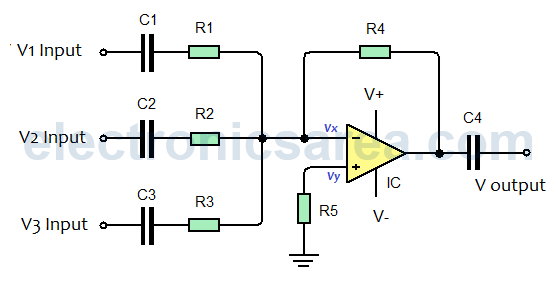 Thus the total current in the feedback resistor is equal to the sum of the input currents. The feedback current is equal to: It = I1 + I2 + I3. 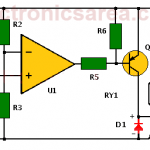 The summing amplifiers work both in direct current (DC) and in alternating current (AC). 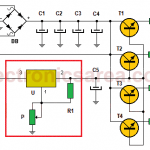 In order to work in alternating current, the coupling capacitors are placed at the inputs and outputs of the amplifier. The function of the coupling capacitors in the summing amplifier in alternating current is to block the DC component of the input and output signals, allowing only the alternating component to pass.